This self-created story doesn’t belong to any of my worlds this time, but our human world: the earth. Many thounsands years ago in old China, dragons were very common. They were ruling the sky, they were free and lived in peace. No-one knows what happend, but suddenly they disappeared. Some hundred years later, they were nothing more than just fairytales, and only some rumores were saying that they have really lived. 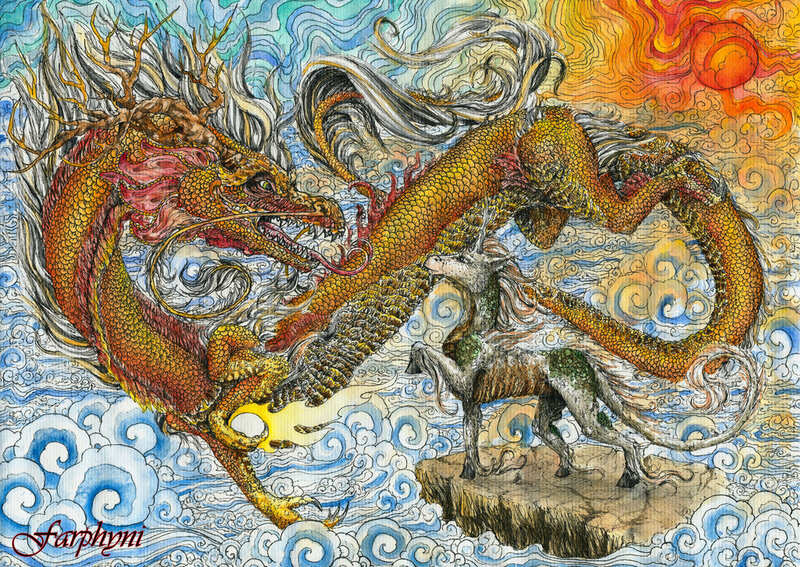 There was a young Kirin, called Lunn’samaeria, who belived in this stories and hoped that this majestic creatures, called dragons, were still alive. Every morning she climbed up the highest mountain, looking to the rising sun and daydreamed about a dragon flying around it. All the other Kirins called her a daydreamer and crazy. But Lunn didn’t mind. Even her parents looked at her with that “daughter-you-are-crazy”-look, but Lunn didn’t mind; as she felt it deep in her heart, that there are still dragons. One morning she climbed up that enormous moutain. She looked around and was amazed by all the clouds, which are covering the sky under her. Only the top of “her” mountain came through the cloud cover. And then the sun rised. Lunn watched it for about four hours, when the sun finally was totally round. Suddenly she saw a movement on the sun. She squinted and laughed about herself, “Finally I’m really getting crazy”.She looked at the sun again..and, HEY! There’s it again..that movement… That movement formed to a long ribbon and got larger and larger as it came nearer and nearer. Lunn couldn’t believe her eyes as the ribbon formed to a graceful golden dragon. The dragon flew towards Lunn, flew around her, looked at her and said with a big grin, “Good morning, young fellow!” Then he began to fly away. Lunn stared at him and finally found her voice again,” W-WAIT!!”. The dragon turned around and came back and looked quizzical at her with his friendly face, “Yeah?”. “You-You are a dragon! a real dragon!!”. The dragon laughed, “of course I am!”. “But stories are saying dragons don’t exsist anymore…”. “Ah, well…that’s a long story. Of course there are still dragons here in china, but they are very seldom. We prefer to live alone now.” “…but,…why?” “Because I’m not a real dragon anymore..well, it’s complicated.” He made a short break, “No! let’s start that way: I’m Marrachio. I look like a material dragon, but I’m an astral creature, I’m a spirit of light, a spirit of the sun.” Lunn looked confused at him, “What does that mean?” “I bring the light to this world – to every world. I bring warmth and hope.” “Oh,wow, but you are still a dragon?” “In some way yes” He smiled. “But if you are a Spirit of Light, is there also a Spirit of Darkness?” “You are a clever one. Yes, I have a sister. Together we keep light and darkness in balance. I’m very sorry but I have to continue my way now. Just some final words: keep the light in your heart shining!” With one claw he touched her right above the heart and smiled, “Goodbye! Maybe I’ll see you again one day..!” With that words her turned to thousands of sparks of light. “Goodbye, Marrachio”, Lunn whispered. About two-hundred years later Lunn was very old and she knew that she is going to die soon. Every day of her life she had climbed the giant mountain every morning, but Marrachio, the golden dragon spirit, never came again. When she woke up one morning she felt so weak, but nevertheless she climbed the mountain. When she reached the top she saw the sun rising with all her beauty. She smiled and said to herself, “The sun looks as wonderful as Marrachio. Now I can die in peace.” She smiled and closed her eyes. But suddenly she felt an unnormal warmth and opened her eyes again. Two green dragon-eyes looked at her, “What a wonderful morning!” Marrachio landed next to her and looked smiling at the sun. “Marrachio!” He grinned and examined her with a long look, “You got very old, my friend.” “Yes, I’m going to die soon..” “Are you afraid, Lunn?” “No”, she said smiling, “Even when I die, the light will always be in my heart.” For a while no one said a word and they watched the sun climbing higher and higher. “Lunn?” . Lunn looked quizzical at Marrachios. “It’s time for me to choose a companian. Everyone of the other High Spirits already has one. I want to choose you.” Lunn looked unbelieving at him, “R-really?” “Yes!” “Do I have to do something to become your companian?” “No,” he smiled, “you already did everything. Just keep the light in your heart shining until you die.” She looked at him, “well, that’s an easy task”. The dragon laughed “for you: yes. But not for most other creatures”. Together they watched the sun rising and Lunn felt more and more tired. When it was about midday she fell asleep and died. Her soul left her material body and so she became the light spirits companion.